Still Bay is a popular seaside holiday destination, especially over the summer holidays. Still Bay has a fine swimming beach on the Indian Ocean and offers excellent boating on the river. At Palinggat (a farmhouse built in 1814) eels are fed daily by visitors. Artefacts of the Middle and Late Stone Age were found in this area - known as the Still Bay Culture. More recently the Khoi-Khoi people lived in this area. When the Dutch settled here there were numerous skirmishes between them and the Khoi-Khoi. A smallpox epidemic wiped out the Khoi-Khoi tribe in 1713. The modern village of Still Bay was established in 1894 and it was used more for holiday purposes than for permanent residence. Residents settled on both sides of the river. Between 1930 and 1955 a pontoon ferried vehicles across the river. A bridge was built in 1955. Still Bay became a municipality in 1965. 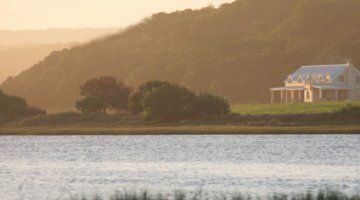 Stilbaai is known for the destination of dreams in the modern South Africa. This place captivates visitors, which fall in love with the unspoiled majestic nature which is complemented by harmonious safe and tranquil community. Things to do in this paradise by the sea, includes golf, bowls, hiking, angling, and many more that can be enjoyed. Stilbaai offers an unsurpassed natural experience on the Garden Route. In spring the town and the dunes are transformed into a spectacle of colour with thousands of flowers bursting into bloom. The steps if prehistoric nab can be marveled at in the ancient fish traps which are visible at low tide. Tame eels are fed at 11h00 daily at the historic homestead, Palinggat. 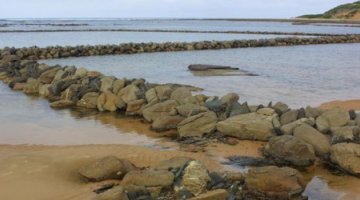 Although the popularity of Stilbaai as one of the best tourist destinations on the Garden Route is growing at an ever-increasing rate, it maintains its characteristics as a pollution-free, safe and peaceful destination. It has long stretches of white sandy beaches, mild weather and a river which is navigable for 15 km. The weather is ideal for holiday making with moderate temperatures, and beautiful sunshine days. Temperatures fluctuate between 20°C and 28ºC on average in summer and between 12ºC and 20ºC on average in winter. Rainfall averages 639,2 mm per annum. c walks and river and sea fishing. Revised: 25 Jan 2010 13:55:57 +0200.